Sawstop PCS with Incra TS-LS and Dust collection mod. After many years of working on a basic Jet JWTS-10 that I got off Cragislist, I finally got a chance to purchase a Sawstop PCS. The saw purchase came after adding a Clear View Cyclone to the shop, but that’s another story. The Sawstop packaging was outstanding. Ease of assembly and directions were excellent. Fit and finish were also excellent and I found the tool alignment and calibration to be very good right out of the box. I purchased the PCS 3hp. unit with the 52” fence system, the industrial cabinet base and some extra cartridges and throat plates. My goal was to continue using my Incra TS-LS fence with 92” rails. I hoped that would not be a problem. Incra provided great support and the fence installation was rather simple. Assembly of the PCS went slow due to the massive weight of the system and the fact I was putting it together by myself. The biggest hurdle was standing the unit upright in the industrial base. I figured out that if I placed the unit on its back on a stack of the two large Styrofoam packing pieces, I could snug up the base below the cabinet and then stand it up on the base. Took some effort, but got it done with no damage. Just a few aspirin for my back that evening. Adding the cast iron wings was also a challenge. Those things are very heavy and difficult to maneuver when you are trying to put bolts in at the same time. I have been an avid user of the Incra TS-LS fence for several years and wanted to continue using my fence. So, I did not install the 52” fence or right side table and for the time being have installed my Incra fence and DIY melamine table. My only concern here is that the T-Glide fence rails are heavy, solid rails that I’m sure do something to help support the ends of the cast iron wings. From web searches I saw many Incra and sawstop owners have not had any reported problems with the Incra fence and the cast iron wings. So, I continued the setup with my Incra system and will hope for the best. If that doesn’t work out, I will unpack the T-Glide fence and install it. Adding the incra fence was very straight forward. I used metric bolts sized M8-1.25×30 for all the fence rail mounting brackets. The four bolt holes on the cabinet cast iron table are threaded and those bolts fit perfectly. I used same bolts on the wings, but added washers and nuts since those holes are not threaded. I did purchase two additional brackets from Incra since I wanted to do what I could to add stability to the wing ends. Frankly, I wish I could have used the massive T-Glide rails to hold everything in place, but you can’t use those rails and the Incra rails at the same time. For the PCS, you do not need the larger Incra base that you need for the industrial Sawstop model. The right table that comes with the 52” Sawstop fence is over 2” thick and cannot be easily added to the Incra fence rails unless you wish to purchase 4 more fence rail brackets which are rather pricey. So, I decided to use my previous table which is white melamine. I used Incra’s Rotuer table support brackets to seamlessly add the table to the Incra rails. I have decided not to add my router table top to the saw and am hoping to build a separate router table later. After calibrating the Incra fence I fired up the PCS for the first time and make a 2” cut on a scrap piece of plywood. My calipers showed the piece to be 2” and a few thousands across a 2 foot length. Awesome accuracy for the saw right out of the box!!!! My recently installed Clear Vue Hybrid cyclone is a beast and generates some serious CFM and air velocities. I was not sure how well the small 4” dust port on the cabinet and super small 1.5” dust port on the blade guard would work. After a few test cuts, the 4” port worked very well and the blade guard was excellent until the end of the cut. You do get some dust thrown at you as the piece still has the blade guard elevated but the short lumber piece no longer seals the blade guard. I did notice just a little bit of dust remaining inside the cabinet floor after a few cuts. I suspect the cabinet will eventually fill with some sawdust. Since the dust port is connected to 4” flex hose that connects to the blade area, that dust will just sit in the bottom of the cabinet. Due to the large capability of just one open 6” main duct, I needed two 4” ducts plus the blade guard hose. Once 4” duct was not being used and just helped keep air volume flowing for the system. I decided to add a second 4” duct to the back of the motor cover and that seems to have really helped in keeping the cabinet base clear of any sawdust. I did not want to cut into the metal portion of the cabinet but was willing to cut into the plastic motor cover which I can replace if I don’t like the idea. On day one of the completed assembly, I am thrilled with the Stopsaw and my dust collection system. I really appreciated having Bill Pentz’s site to reference dust collection information. In summary, the Sawstop seems to have been the right choice for me. Excellent quality tool that is properly set up right out of the box. My only misgiving right now is on the effectiveness of the blade guard dust collection effectiveness. Mind you, it works great as long as the entire blade guard seals against the lumber piece. Toward the end of the cut, it does spit out a little bit of dust. The fact this is my only gripe shows what a great saw this really is. 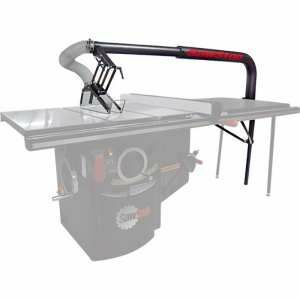 I did see that Stopsaw just released and is now selling a new blade guard dust shroud that is made for the industrial saw that uses a 4” dust port if I’m not mistaken. I might have to get one of those for my system. Congrats and good luck on the saw, and the new dust collection. I’ve got the same saw and it’s great (along with a ClearVue 1800.) The two areas I see as not terrific with the saw you’ve mostly identified – the stock fence is not really straight/flat, and the dust collection, both in the cabinet and the blade guard could be better. I like you idea of adding another 4” port to the motor cover, I may try that. Another suggestion I saw recently was to remove the shroud around the blade, and just vent the cabinet. The two together may really improve the dust pickup. Having said that, I’ve had my saw for about 18 months now and there isn’t that much dust in the bottom of the cabinet. I did junk the stock blade guard and replace it with a SharkGuard with a 4” port. SawStop claims theirs has a 1 1/4” port, but if you look inside it reduces down a lot smaller where the hose transitions into the blade guard. It really restricts off air flow. I’d love to see them come out with a guard that moves more air. I replaced my fence with a Very Super Cool Tools fence – not cheap, but a big improvement, as I’m sure your Incra fence is too. I agree with your assessment on dust collection. I measured the interior of the blade guard throat and it is just over 1.25” IIRC. It works, but could be better. Sawstop just announce the TSG-FDC floating dust guard. I will have to take a look at one when they are available in stores. Seems to be more of what we need with the CV1800 dust collector. As I indicated, the current shroud works perfectly until you get near the end of the piece being cut. I also suspect it will spray stuff at you if you are just cutting a bit off the edge of a work piece. Can’t be helped with such low airflow in that shroud. As far as the stock fence, I have no idea how good it is. Mine is still in the box since I really prefer and have been used to working with my Incra fence. The incra is so incredibly accurate I just don’t want to start over with a new system. P.S. I went to the Rockler site and was taking a good close look at the pictures they have of the new floating guard. I am not sure that will work any better. Yes, great air volume with a 4” hose pickup. But, there is no mechanical block near the front of the guard to stop the dust being fired forward by the blade. Bill Pentz addresses this issue on his site and indicates you need some sort of mechanical block to stop those pieces moving at over 100MPH. I have also been taking a look at the Shark Guard. Congrads on buying a terrific saw. It is accurate and well designed. However, you are right in that the dust collection around the blade is not great and the guard often gets in the way. I looked at the SharkGuard but the reviews on Amazon were not exactly enthusiastic. Thank you. As I see it, the stock guard does a great job of getting all the dust as long as the guard has lumber under the entire length of the guard. Once the work piece nears the end of the cut, the front of the guard become exposed and is above the table equal to the height of the work piece. This is where I get some dust flung out toward the operator. My guess is that this issue will be a problem with ANY blade guard. I know the shark guard would provide larger airflow than the stock guard, but the stock guard doesn’t really need the airflow due to its design. As long as I have enough air moving to get the dust up the flex hose I’m good. The stock guard has a channel that captures the dust coming off the top of the blade and uses that momentum plus the air current to send it to the rear of the blade guard. I would guess if you had no dust collection at all it will still send the dust to the back of the saw. I will live with this guard for a while and see how it performs with a full day of work. At this point I have drained my toy funds so no need to rush out and get some after market parts that may not be much better. I can confirm the SharkGuard isn’t perfect, you’ll still get dust escaping doing a trim cut, but it’s much better than the stock guard. You’ve got a terrific setup. Good carpenters don’t blame their tools because good carpenters use great tools. You’ve done that in spades. Congratulations and enjoy. Which dust collector do you have? Let us know which blade guard you choose and how it works out. You ve got a terrific setup. Good carpenters don t blame their tools because good carpenters use great tools. You ve done that in spades. Congratulations and enjoy. Thank you. I am finally getting some good tools. The Sawstop is just amazing. I have a Clearvue CV1800 Hybrid DC, with 6” lines throughout the shop. I’m in the middle of that install right now. I did find that the Sawstop blade guard collector might just be good enough. The error was mine in how I plumbed the DC lines. I had taken a 6” line about 2 feet toward the blade and then reduced that to a 2” line which connected to the blade guard. I subsequently remembered something I had read on Bill Pentz site concerning doing something like that. Bottom line is that there is not enough air volume coming from the blade guard through the small 1.25” opening then to a 2” line and then a 6” line. Once the dust gets to the 6” line, there is very little air movement and the dust just starts to stack up in the 6” line. I modified the line to reduce to 2” right at the 6” wye so that the high air velocity is right at the end of the 2” line. I now get considerably more suction at the blade shroud and have been more pleased with its performance. Rudy81, I have spent weeks looking for someone who has the same or partial setup as mine. I just purchased the PCS 3hp SS with IND mobile base and the premium fence as I too plan to use my Incra TS-LS positioner which used to reside on the Ridgid R4512 I own. I am still putting mine together so I can’t honestly review the setup just yet. I was hoping you could tell me the dimensions of your melamine section of your sawstop. Also are you using the longer 92” Incra rails vs the shorter rails? My dust collection system is currently using the Harbor Freight 2hp blower with the Super Dust Deputy but I have had my eye on the Clearvue Cyclone system. I will post pics as soon as I have completed my setup. Totally looking forward to using my new SawStop. Anyone who has read my post is welcome to chime in. Happy Woodworking!!! I originally had the shorter rails, but wanted the added capacity, so I purchased an extra set of long rails. I am still sing the long rails and love the setup! Needless to say, the saw and LS combo is fantastic. I never even opened the original fence boxes on the SS. The Clearvue Cyclone will kill the HF blower. I got the hybrid cyclone with the larger impeller. I use 6” lines in the shop and the cyclone performance is outstanding. Melamine extension is 28”x43” and has stood the test of time. I used the red incra router table supports to attach the melamine to the LS rails. If you are using the shorter rails, I don’t think you will even need an extension table. Hey Rudy, thanks for the quick response man, much appreciated. So long story short, my wife decided I needed the SS after losing some skin and nail on two of my fingers so we brought the SS home. I agree with you I may not need the extension table but haven’t quite decided yet. Keeping options open. Purchased the Super DD and Harbor Freight DC a few months ago but I may (= will) upgrade to the Clearvue later depending on how my dust collection goes. I have two Grizzly bandsaws, Hitachi 12” compound MS and an old Rockwell 6” jointer (next upgrade) and plans to build a stand-alone router cabinet so I seriously need to think about which way my dust collection should go. Again, thanks for the assist. Glad to help! Let me know if I can answer more questions. If at all possible, give the Clearvue some real thought. Your lungs will thank you. As far as the SS, I had several close calls, mostly due to kickback and a cheap saw with few safety features. I never even thought of spending the money for a SS. The day my son asked if I could teach him to use the table saw….well, that was the day I decided I HAD to get a SS! I know….stupid to wait that long. The saw is fantastic and has excellent precision and is a quality tool at that price point. IMHO, the Incra fence takes it to a level of precision above anything I have the skill to use. If you are not familiar with the dust collection work of Bill Pentz, take the time to read his work. You will no longer doubt the need for true DC. Your lungs will than you. I have read Bill Pentz’s work and knowing myself I will find a justification for spending the extra do re mi’s but until then I will work with what I have. I just shelled out over a grand for a second bandsaw and now the SS. Gotta let a few more leaves mature on the money tree if you know what I mean, but the advice about the Clearvue is well taken. By the way I needed Ibuprofen for my back and I had help. Thanks again.